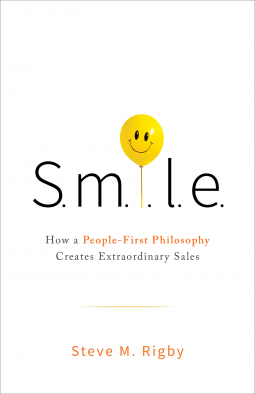 In S.M.I.L.E., Steve Rigby, author of Circle Selling – A Revolutionary Approach to Sales Success and CEO of New Wings Consulting, LLC, a firm that helps salespeople, sales teams, and companies get in the “people” business, redefines success and focuses readers on making a difference, not just a dollar. This is a book about loving what you do, doing it in a way that impacts lives, and reaching new heights of personal and professional success. The content resonated deeply. Building authentic, caring relationships is a value that resonates and I can testify first-hand results in a rewarding business/ sales experience. The principles and actions outlined make complete sense and can only enable success. This narrative will not speak to the transactional, money chasing individual. The money is not seen as the goal but rather an outcome. The book focuses on identifying and meeting the needs of people. Powerful stuff indeed. However, I didn’t readily with the main character in the parable. The ‘guide’ is a parrot! The other characters are people! He talks, has a wife, carries a cell phone and networks the struggling realtor to a number of individuals, who then add to the dialogue and help her work through all the letters of SMILE. It’s a very easy read - a little syrupy in style for me - but I ’m sure will make what can be a difficult subject easier for many to digest. A great summary at the end is a great reference tool. With many thanks to the author, the publishers Greenleaf Book Group, and NetGalley for my free copy to review.